Last night my wife and I took a chance on a new local restaurant and music venue. It was a slow night and we stayed until they were ready to close up, having conversations with the chef and bartender. In an effort to let us know they were in no rush to kick us out, the bartender said “see, I even left your table candle turned on”. The candle was one of those waxy electronic candles with an on and off switch that glows like it has a flame, but in deed poses no threat to the flammable table cloths. Not the newest “technology” of course, but read more about it and it still struck me in that moment that you would never have heard someone talking about “turning off” a candle even ten years ago. You blew it out. Because that’s how you extinguish a flame. Archaic, I know. 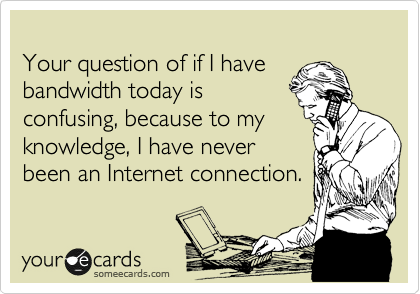 We use the term “bandwidth” – a computing term referring to bit rates and data transfer capacity – to refer to our available time / brain power when referring to our capacity to take on new tasks at work – e.g. “I don’t have the bandwidth for another project right now”. We use the term “hacking” – also a computer-focused term related to “creatively overcoming and circumventing limitations of programming systems” to refer to multiple types of boundary-busting – e.g. “life hacking”, “hackathons” for building entrepreneurial concepts, etc. We use the term “download” – referring to transfer of digital data – to signify sharing information – e.g. “lets have a meeting to download the findings from our latest research study”. And my personal favorite – “multitasking” – used to refer to a computer’s ability to simultaneously execute more than one task, and now a very human term for the ability to do several things at one time – and often listed in job descriptions,. E.g. “must be able to multi-task and handle several projects at once”. It’s fun to think about how culture changes when the structural environment changes and how that gets integrated into our everyday communication. Any other good ones from the WordPress Peeps? In the meantime, this Narcissistic Anthropologist needs to “Sign off” so I can get some work done before I’m “cached out”. Thanks Jamie. The “macroforce” is all the growing abundance of tech stuff in our built environment. The “people trend” is how our attitudes, behaviors and thoughts (some might even say worldviews) change in response to this environmental change. Language is a wonderfully rich way to understand how we are evovling with our ever-more-digitized world.